News Get Your Yard Ready for Spring! The long winter wait is over at last – spring is here! Many of us have spent the last few months bundled up inside, not overly concerned with our patchy brown yards. 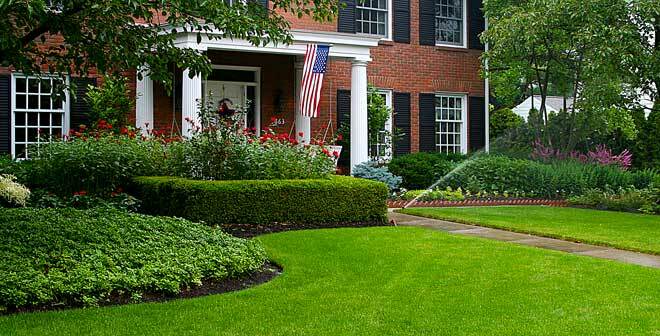 But that maintenance vacation has come to an end and it’s time to tackle all of the tasks necessary to have your lawn on the road to summer perfection! Here are the steps you need to take, and the order in which you should take them, to get everything outside your door back on track. What is “thatch” you might be asking? Thatch is a layer of dead and living grass shoots, stems and roots that shows up between the soil and the grass blades in your lawn. A little bit of thatch is good – it insulates your grass from extreme temperatures and excess moisture. But when it thickens to more than half an inch, thatch stifles grass growth and can cause grass to rot from the roots up. To remove, you’ll need a dethatcher, which can be purchased at your local hardware store. For larger yards you may want a battery operated power model, but for smaller yards a simple dethatching rake will do the trick. After dethatching, feed your grass with a combination product that includes fertilizer and pre-emergent, an herbicide that prevents crabgrass. Many of these combinations also include weed killer – finding a product with all three combined is a great way to save time on lawn maintenance. When it comes to preventing crabgrass, temperature is everything – make sure you apply this product before the warm spring days raise the soil temperature above 60°. Take a walk around your yard armed with your clippers, and snip off any dead or wayward branches from small trees and shrubs. If dead branches are left unattended, they can fall during spring storms, causing property damage and potential injury. For taller trees, consider hiring a professional tree trimmer to do a “safety prune” once every three years. Once your lawn is taken care of, it’s time to replace your mulch. Look for hardwood bark mulches rather than ground wood chips that have been dyed brown. This will make your mulch bedding look better and last longer. Apply your mulch layer 2-3 inches deep, and for a greener option, look for recycled rubber mulch. It is even better than bark at suppressing weeds. Mowing earlier and more frequently in the spring is helpful in facilitating your grass root growth and reproduction. It may sound like a lot, but experts recommend mowing your lawn every 5 days during the first six weeks of spring. Take this opportunity to check your mower’s blades for signs of wear and rust. A dull blade will rip grass rather than cut it, increasing the chance of infection and water loss. Mow to a height of 2.5 to 3.5 inches to produce a tougher turf that crowds out unwanted weeds and is less susceptible to summer heat and drought. If your yard includes more brown patches than green grass, you may be tempted to fill in the blanks with grass seed. However, if you are also applying pre-emergent or weed killer, the seeds won’t germinate. Instead, fertilize your lawn, then sit back and be patient. In a few weeks new shoots will grow and fill in those troublesome brown spots. If the brown patches are too big, or you just can’t stand to wait, applying new sod is the better option.